Not to be confused with socialist realism or real socialism. 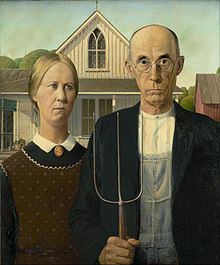 Grant Wood's American Gothic, 1930, has become a widely known (and often parodied) icon of social realism. Social realism is the term used for work produced by painters, printmakers, photographers, writers and filmmakers that aims to draw attention to the real socio-political conditions of the working class as a means to critique of the power structures behind these conditions. While the movement's characteristics vary from nation to nation, it almost always utilizes a form of descriptive or critical realism. Taking its roots from European Realism, Social Realism aims to reveal tensions between an oppressive, hegemonic force, and its victims. The term is sometimes more narrowly used for an art movement that flourished between the two World Wars as a reaction to the hardships and problems suffered by common people after the Great Crash. In order to make their art more accessible to a wider audience, artists turned to realist portrayals of anonymous workers as well as celebrities as heroic symbols of strength in the face of adversity. The goal of the artists in doing so was political as they wished to expose the deteriorating conditions of the poor and working classes and hold the existing governmental and social systems accountable. Social realism should not be confused with socialist realism, the official Soviet art form that was institutionalized by Joseph Stalin in 1934 and was later adopted by allied Communist parties worldwide. It is also different from realism as it not only presents conditions of the poor, but does so by conveying the tensions between two opposing forces, such as between farmers and their feudal lord. However, sometimes the terms social realism and socialist realism are used interchangeably. Charles de Groux, The blessing 1860. In Russia, Peredvizhniki or "Social Realism" was critical of the social environment that caused the conditions pictured, and denounced the "evil" Tsarist period. Ilya Repin said that his art work was aimed “To criticize all the monstrosities of our vile society” of the Tsarist period. Similar concerns were addressed in 20th-century Britain by the Artists' International Association, Mass Observation and the Kitchen sink school. Social realist photography draws from the documentary traditions of the late 19th century, such as the work of Jacob A. Riis, and Maksim Dmitriyev. 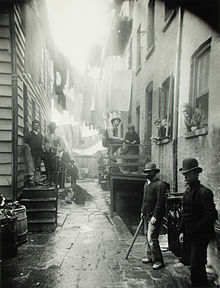 Jacob Riis, Bandit's Roost, 1888, from How the Other Half Lives. Bandit's Roost at 59½ Mulberry Street was considered the most crime-ridden part of New York City. In about 1900, a group of Realist artists led by Robert Henri challenged the American Impressionism and academics, in what would become known as the Ashcan school. The term was suggested by a drawing by George Bellows, captioned Disappointments of the Ash Can, which appeared in the Philadelphia Record in April 1915.
Notable Ashcan works include George Luks’ Breaker Boy and John Sloan’s Sixth Avenue Elevated at Third Street. The Ashcan school influenced the art of the Depression era, including Thomas Hart Benton’s mural City Activity with Subway. The term dates on a broader scale to the Realist movement in French art during the mid-19th century. Social realism in the 20th century refers to the works of the French artist Gustave Courbet and in particular to the implications of his 19th-century paintings A Burial at Ornans and The Stone Breakers, which scandalized French Salon–goers of 1850, and is seen as an international phenomenon also traced back to European realism and the works of Honoré Daumier and Jean-François Millet. The social realist style fell out of fashion in the 1960s but is still influential in thinking and the art of today. In the more limited meaning of the term, Social Realism with roots in European Realism became an important art movement during the Great Depression in the United States in the 1930s. As an American artistic movement it is closely related to American scene painting and to Regionalism. American Social Realism includes the works of such artists as those from the Ashcan School including Edward Hopper, and Thomas Hart Benton, Will Barnet, Ben Shahn, Jacob Lawrence, Paul Meltsner, Romare Bearden, Rafael Soyer, Isaac Soyer, Moses Soyer, Reginald Marsh, John Steuart Curry, Arnold Blanch, Aaron Douglas, Grant Wood, Horace Pippin, Walt Kuhn, Isabel Bishop, Paul Cadmus, Doris Lee, Philip Evergood, Mitchell Siporin, Robert Gwathmey, Adolf Dehn, Harry Sternberg, Gregorio Prestopino, Louis Lozowick, William Gropper, Philip Guston, Jack Levine, Ralph Ward Stackpole, John Augustus Walker and others. 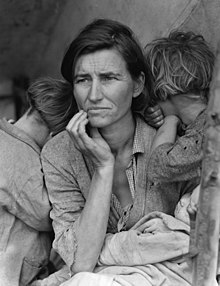 It also extends to the art of photography as exemplified by the works of Walker Evans, Dorothea Lange, Margaret Bourke-White, Lewis Hine, Edward Steichen, Gordon Parks, Arthur Rothstein, Marion Post Wolcott, Doris Ulmann, Berenice Abbott, Aaron Siskind, and Russell Lee among several others. In Mexico the painter Frida Kahlo is associated with the social realism movement. Also in Mexico was the Mexican muralist movement that took place primarily in the 1920s and 1930s; and was an inspiration to many artists north of the border and an important component of the social realism movement. The Mexican muralist movement is characterized by its political undertones, the majority of which are of a Marxist nature, and the social and political situation of post-revolutionary Mexico. Diego Rivera, David Alfaro Siqueiros, José Clemente Orozco, and Rufino Tamayo are the best known proponents of the movement. Santiago Martínez Delgado, Jorge González Camarena, Roberto Montenegro, Federico Cantú Garza, and Jean Charlot, as well as several other artists participated in the movement. With the onset of Abstract Expressionism in the 1940s, Social Realism had gone out of fashion. Several WPA artists found work with the United States Office of War Information during WWII, making posters and other visual materials for the war effort. After the war, although lacking attention in the art market, many social realist artists continued their careers into the 50s, 60s, 70s, 80s, 90s and into the 2000s; throughout which, artists such as Jacob Lawrence, Ben Shahn, Bernarda Bryson Shahn, Raphael Soyer, Robert Gwathmey, Antonio Frasconi, Philip Evergood, Sidney Goodman, and Aaron Berkman continued to work with social realist modalities and themes. Although often fluctuating in and out of fashion, social realism and socially conscious art making never died out and continues today within the contemporary art world, including artists Sue Coe, Mike Alewitz, Kara Walker, Celeste Dupuy Spencer, Allan Sekula, Fred Lonidier, and others. Artists worldwide have employed social realist themes as response to social, economic and political issues. Social realism in the United States was inspired by the muralists active in Mexico after the Mexican Revolution of 1910. The largely propagandizing murals emphasized a revolutionary spirit and a pride in the traditions of the indigenous peoples of Mexico, and included Diego Rivera’s History of Mexico from the Conquest to the Future, José Clemente Orozco's Catharsis, and David Alfaro Siqueiros’s The Strike. These murals also encouraged social realism in other Latin American countries, from Ecuador (Oswaldo Guayasamín's The Strike) to Brazil (Cândido Portinari's Coffee). In Belgium, early representatives of social realism are to be found in the work of 19th century artists such as Constantin Meunier and Charles de Groux. In Britain artists such as the American James Abbot McNeill Whistler, as well as English artists Hubert von Herkomer and Luke Fildes had great success with realist paintings dealing with social issues and depictions of the "real" world. Artists in Western Europe also embraced social realism in the early 20th century, including German artists Käthe Kollwitz (Raped Woman), George Grosz (Teutonic Day), Otto Dix, and Max Beckmann; and Swedish artist Torsten Billman; and Dutch artists Charley Toorop (The Friends’ Meal) and Pyke Koch; and French artists Maurice de Vlaminck, Roger de La Fresnaye, Jean Fautrier, and Francis Gruber and Belgian artists Eugène Laermans and Constant Permeke. Realism, a style of painting that depicts the actuality of what the eyes can see, was a very popular art form in France around the mid- to late-19th century. It came about with the introduction of photography - a new visual source that created a desire for people to produce things that look “objectively real”. Realism was heavily against romanticism, a genre dominating French literature and artwork in the mid-19th century. Undistorted by personal bias, Realism believed in the ideology of external reality and revolted against exaggerated emotionalism. Truth and accuracy became the goals of many realists as Gustave Courbet. The French Realist movement had equivalents in all other Western countries, developing somewhat later. In particular, the Peredvizhniki or Wanderers group in Russia who formed in the 1860s and organized exhibitions from 1871 included many realists such as Ilya Repin and had a great influence on Russian art. From that important trend came the development of Socialist Realism, which was to dominate Soviet culture and artistic expression for over 60 years. Socialist Realism, representing socialist ideologies, was an art movement that represented social and political contemporary life in the 1930s, from a left-wing standpoint. It depicted subjects of social concern; the proletariat struggle - hardships of everyday life that the working class had to put up with, and heroically emphasized the values of the loyal communist workers. The ideology behind Social Realism by depicting the heroism of the working class was to promote and spark revolutionary actions and to spread the image of optimism and the importance of productiveness. Keeping people optimistic meant creating a sense of patriotism, which would prove very important in the struggle to produce a successful socialist nation. The Unions Newspaper, the Literaturnaya Gazeta, described Social Realism as “the representation of the proletarian revolution”. During Joseph Stalin’s reign, it was most important to use socialist Realism as a form of propaganda in posters, as it kept people optimistic and encourage greater productive effort, a necessity in his aim of developing Russia into an industrialized nation. Vladimir Lenin believed that art should belong to the people and should stand on the side of the proletariat. “Art should be based on their feelings, thoughts, and demands, and should grow along with them,” said Lenin. He believed that all Soviet art forms should “expose crimes of capitalism and praise socialism...created to inspire readers and viewers to stand up for the revolution”. After the revolution of 1917 leaders of the newly formed communist party was encouraging experimentation of different art types. Lenin believed that the style of art the USSR should endorse would have to be easy to understand (ruling out abstract art such as suprematism and constructivism) so to be understood by the masses of illiterate people in Russia. A wide-ranging debate on art took place, the main disagreement was between those who believed in "Proletarian Art" which should have no connections with past art coming out of bourgeois society, and those (most vociferously Leon Trotsky) who believed that art in a society dominated by working-class values had to absorb all the lessons of bourgeois Art before it could move forward at all. ^ a b Alice., Guillermo, (2001). Protest/revolutionary art in the Philippines, 1970-1990. Quezon City: University of the Philippines Press. ISBN 9715421679. OCLC 50184719. ^ "Social Realism". Retrieved 4 May 2008. ^ "Raphael Soyer | artnet". www.artnet.com. Retrieved 12 February 2019. ^ "Getting the Message Out". National Archives. 15 August 2016. Retrieved 12 February 2019. ^ a b "Social Realism - Concepts & Styles". The Art Story. Retrieved 12 February 2019. ^ David Ethan Stark (1979). Charles de Groux and Social Realism in Belgian Painting, 1848-1875. Ohio State University. ^ Jeff Adams (2008). Documentary Graphic Novels and Social Realism. Peter Lang. pp. 34–. ISBN 978-3-03911-362-0. ^ James Fitzsimmons; Jim Fitzsimmons (1971). Art International. J. Fitzsimmons.